Spring Cleaning is a great way to shake off post winter blues. It helps you gear up for a few months of warm weather, fresh flowers, and spending more time outdoors. For most us, the downside of spring comes with spring cleaning. The holidays are over, kids are wrapped up in school, and there are no more excuses. On the upside, spring cleaning gives us a fresh start on how we want to clean and organize our homes. Incorporating a pressure washer into your spring cleaning agenda will not only save you some time, but it can also be a fun and different way of removing allergens and whisking away months of dirt, dust, and grime from around our home. Spring cleaning also allows you to take a step back and consider everything you use and interact with everyday that you might not notice just how dirty it has gotten overtime. Pressure washers can help clean home exterior, patio furniture, paths and walkways, playground equipment, fences, and anything that tends to spend a lot of time outdoors. Even your car or boat can look fresher and brighter after a pressure washing. Driving your car through a gas station car wash, or washing it by hand, can only do so much, so a pressure washer cleaning on your car can leave it looking like new. Some people’s first reaction might be, “a pressure washer seems a little excessive. It just isn’t really necessary.” On the contrary, a pressure washer can support your spring cleaning in ways you never thought possible. Let’s start with the more obvious. We never think to wash the exterior of our house. We take care and pride on the inside, with the windows, or maybe with the gutters, but what about the rest of it? After 1-2 years, excessive build up cause mold problems and even damage the exterior of your home. Pressure washing makes it so that you can clean off your home without damaging the paint. Attachments are available that make it so that you can easily access multiple levels of your home, and even clean your gutters. While you can find dozens of videos and tips on how to clean the exterior walls of your house, many do not consider the less obvious exterior set up around their home. Concrete walkways and driveways are expected to get dirty, and it happens so gradually that we might not realize just how much build up had accumulated overtime. 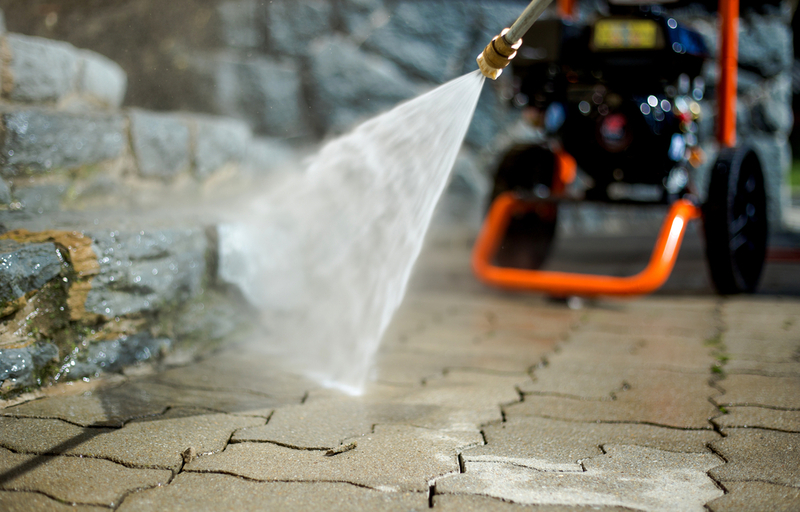 Pressure washing your driveway with a detergent can whisk away of years of dirt and grime in a matter of minutes. Fences around your home are another often neglected exterior piece. Pressure washing your fence can erase dirt, old paint, or old stain along with years of mold and mildew. It is important that you consider the pressure washing psi and settings in order to not cause any damage to your fence, especially a wooden fence. See this blog for more information. An overlooked area that will definitely benefit from spring cleaning is outdoor children’s toys or playground equipment. After a winter of little use, there has been an adequate amount of time for dirt and grime to build up to levels that will make that first backyard of spring result in some dirty children. Whether it is spilled drinks, germs from sticky hands, or just general dirt and dust, a pressure washer can relief the playground equipment from all of that. Similarly, a picnic table may be a hassle to clean and a pressure washer can push away the dirt, or even the old gum stuck to the bottom. For those of us lucky to have a pool to relax in, a pressure washer can keep your pool area looking clean and inviting after the months of winter neglect. Decks benefit tremendously from a good pressure wash as we might get tricked by dirt blending in with the stain of the deck. Kickoff pool season by spending some time cleaning the deck and the areas around the pool. If your yard has concrete or other surfaces that may be more difficult to clean, you can check this blog about appropriate PSI/GPM for concrete for driveway cleaning. We protect our trash cans by lining them with plastic bags, but have you ever had to grab fallen trash from the bottom? Without us even realizing it, the bottoms and sides of trash cans accumulate so much from our trash no matter how secure we are with our plastic bags. It gets sticky, moldy, and you might not even notice until it starts to give off the smell. Many will routinely wash out their trash cans with the garden hose, but this really only pulls apart the larger pieces and gives us a false sense of cleanliness. The hard to see bacteria residue will remain and continue to grow unless we use a pressure washer. A rotating scrub brush allows the pressure washer to break up disgusting bacteria from the bottom of your trash can without have the pressure of the water push back into your face. Using a detergent will ensure that the bacteria is destroyed as the pressure washer pushes the build up away. When people think about summer, they think of spending time outdoors around a BBQ with family and friends, enjoying the weather and each other’s company with a good meal and good fun. Most would agree that there’s nothing better than relaxing outside on a patio during the warmer months. Our spend time and energy picking the best furniture for our outside spaces, shouldn’t we clean and maintain that furniture the same way we do indoors? Patio furniture can develop dirt and build up quickly without us realizing it until it’s just plain filthy. Wind picks up dirt and pollen and it finds a way to settle on our nice outdoor furniture. Pressure washing patio furniture can keep your furniture looking bright and save your time from scrubbing off each speck of dust. When using a pressure washer on your furniture, you’ll want to make sure the furniture is on a flat surface so it will not fall over. Start with a delicate, low setting nozzle and no greater than 2000 PSI. You can increase the pressure if you find you need to, but starting low will make sure you won’t damage the furniture. It is best to start from the top and work your way down when using a pressure washer to clean patio furniture. Vinyl cushions and fabric can just as easily be cleaned with a pressure washer, just make sure you secure it tightly so it does not fall from the furniture. You can incorporate detergent for tougher stains to break up long standing build up, but generally it is recommended that you attempt to scrub with a scouring pad or cloth first before just trying to increase the pressure. For rod iron furniture, a turbo nozzle can be added to just them looking just as clean as the day you bought them. You’ve got the furniture cleaned and rearranged to fit your standards, is your yard ready for a summer BBQ party? Consider that your lawn was maybe not maintained regularly during the winter months and could use a mow. Maybe you should clean that lawn mower before you start working on the lawn. People do not used a dirty sponge to wash their dishes, so you should not be mowing your lawn with a dirty mower. Our lawn mowers see lots of dirt, bugs, and bacteria as they work and we often look at that dirt as a badge of honor for our mower. It’s dirty because we used it to make out lawn look nice. However, your lawn mower may be collecting that grime and bacteria and then spreading it across your freshly cut lawn as you mow. Pressure washing your lawn mower will ensure that you won’t find yourself spreading all the dirt around. Disconnect the spark plug and the blades for safety, then allow a multipurpose pressure washer detergent to sit for 5-10 minutes. Put the mower upright and wash from top to bottom using your pressure washer to make it look as good as new as well as clean. Ready for that perfect summer evening? Well, what about the grill? All of the meat, fat, and grease from last summer has been sitting on it all winter. A pressure wash cleaning will pick that up to give you a practically brand new grill for the upcoming summer. No matter the type of grill, a pressure wash can be applied for a nice clean finish. First step would be to disconnect the propane, gas, or electricity if need be. Before you do anything, inspect your grill to see if there is any fat build up from your previous cookouts. Consider when washing dishes how difficult it is to scrub away fat build up. Fat has likely been sitting on that grill all winter, and a degreaser can be used in your pressure washer just like any other detergent. Once the detergent sits for a bit, you can switch to the pressure washer. Using a fan setting and going from top to bottom with ensure that your grill can look as good as new, without any damage. In a matter of just a few minutes, you’ll be ready for your first summer BBQ party. If you are using a pressure washer for the first time to tackle your spring cleaning job, or even if you just need some reminders, here are some tips on how to get the best results without causing damage to any of your property, or yourself. Depending on the job, you might need a certain PSI/GPM level to get the job done. But it is important to not just assume that the most powerful will get the best results. Pressure washers exert a great deal of force, and you should always be cautious as they can damage and cut through materials. An electric pressure washer will be great for small jobs here and there, but will not be as powerful or as versatile as a gas powered pressure washer. There are varying levels of gas powered units, but there are many ways you can adjust pressure to get the best results. You can consider getting multiple nozzles to adjust the pressure for the specific job. The larger the spray angle, the gentler the pressure so go for a 65 degree nozzle to apply detergent or to just get the surface wet. Generally, this nozzle will not force away any dirt and is really just for basic applications. Nozzle can get as small as 0 degrees to apply to max amount of PSI to the surface. Pressure washer attachments are often specific to certain kinds of jobs, so don’t think you’re stuck with just a jet stream of water to help your spring cleaning. A surface cleaner uses a spinning attachment to cover a larger surface area and is great for large scale cleaning like a driveway or sidewalk. Pressure washing brooms can increase the speed of your pressure washing by providing multiple streams to cover more area. A wand can help your reach higher heights like gutters or second stories without much effort or wobbley ladders. For safety, it is advisable for your to wear safety glasses and/or ear plugs in case of flying debris and loud rumbling of the pressure washer motor. Always control the pressure washer with both hands to maintain control. Ideally, you should keep the spray tip a minimum of 18 inches away from the surface area you’re cleaning to ensure that you will not damage or cut into the material. Always use a test section first to make sure that the PSI, GPM, and detergent will work for the job without causing any destruction. When the washer is in use, use even strokes and do not let the spray linger in one area for too long so that you get a nice, even level clean. Start from the top and work your way down to keep dirt flowing in the same direction and reduce the build up on runaway dirt and dust. Overlap the strokes to avoid lines of dirt or dust left behind from not having enough space because the last stroke.